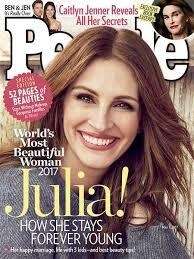 Julia Roberts named People’s ‘most beautiful’ for record fifth time – Royal Times of Nigeria. Julia Roberts was named People magazine’s world’s most beautiful woman for a record fifth time today, but the actress said she thought her best years are yet to come. The forty-nine-year-old was first given the annual honor in 1991, a year after she skyrocketed to fame in the romantic comedy “Pretty Woman.” She was also named most beautiful woman in 2000, 2005 and 2010. The actress, who won an Oscar in 2001 for playing against type in “Erin Brockovich,” has been married for fourteen years to cinematographer Danny Moder, with whom she has three children. Former “Friends” star Jennifer Aniston was last year’s most beautiful woman for People magazine.